March 20 marked the vernal equinox, meaning that every place on Earth experienced a 12 hour day. For those of us in the Northern Hemisphere, our days will continue to grow longer until June 21, the summer solstice. Daylight savings time has also already begun, so we’ve added an hour to the end of our days as well. With all of this extra sunlight, you’d think spring has sprung! But if you’ve lived in Colorado for more than a year, you’ll know that spring doesn’t mean the same thing everywhere you go. 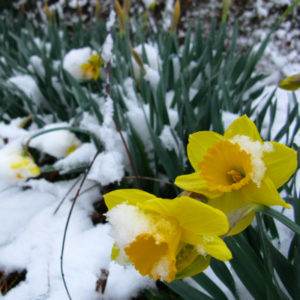 Many of us have probably experienced or witnessed snow in the rocky alpine areas of the mountains in mid-summer. Snow sticks around in the highest reaches of Colorado because as elevation increases, temperature generally decreases. This is why climbing a fourteener in summer often requires a jacket. This is also why going for a springtime hike into the mountains requires carrying snowshoes (or at least crampons) in order to reach those subalpine lakes. I’ve seen countless people turn back on a trail in the spring because they didn’t bring snowshoes for the highest sections of the trail. And even though spring is officially here, that doesn’t mean there won’t be more snow to come. As the snow melts from the lower elevations, green shoots and flowers start to spring up from the mud. Days will feel warmer more often, and you’ll actually get to take an evening walk in daylight. …And then there will come a spring snowstorm. This is the time of year to carry layers for any weather: you might need a winter coat, a rain jacket, and summer shorts all in a single day. Can you imagine how confusing this is for the plants and wildlife around us? Grazers like mule deer and elk will begin seeking the new green shoots, ready for something juicy after eating the dry and crunchy twigs, bark, and needles all winter. The male deer (bucks), elk, and moose (bulls) will lose their antlers and begin growing new ones. Black bears, which have woken up several times throughout the winter, will now have more food to stay awake longer. Bear cubs will come out of dens for the first time with their mothers on the prowl for bugs, shoots, buds, and roots; they’ll also raid your garbage if you aren’t diligent! Birds will begin to fly back from their wintering grounds. You’ll hear new songs that you haven’t heard since last year, and you’ll see more flashes of color in the trees and shrubs nearby. And when spring snowstorms arrive, these critters wait it out because they know it won’t last long. April Fools’ Day is a good reminder that we shouldn’t be fooled by the calendar. Yes, it is technically the spring season now. Yes, daylight savings time is here, and days are growing longer. But we should remember that we live in Colorado. We can see snow every month of the year here. Some people don’t even call it spring; some use the less-beautiful name “mud season,” which isn’t far from reality. If nothing else, spring reminds us to stay flexible to the weather and vigilant to all of the new plant and animal life springing up around us. Nicholas Scarborough is a Foley Graduate Fellow and Educator for Walking Mountains Science Center, working toward his MA in Science Education. In addition to working with children, he also loves to paint, write, hike, and ski. You can find more of his writings about nature and art in his personal blog, The Art Outside, at http://theartoutside.wordpress.com.